HOUSTON (Jan. 26, 2019): Mexican warrior Jaime Munguia (32-0, 26 KOs) successfully defended his WBO Junior Middleweight World Title by defeating Japanese contender Takeshi Inoue (13-1-1, 7 KOs) via 12-round unanimous decision at the Toyota Center in Houston, Texas. After a tough battle, Munguia won with scores of 120-108, 120-108 and 119-109. The action was streamed live on DAZN - which is just $9.99 per month after a one-month free trial. "It was a great fight. He was a great warrior," said Jaime Munguia. "It was a great battle for me. I was surprised by his ability to take punches. He took a lot of punches to the head and to the body. He took punches that would have dropped anyone else. I feel I got a lot of experience from this fight. I will keep working on using my distance. There were times where he was able to cut the distance, and I want to work on that." "With 31 wins and no losses, Munguia was not just a power puncher but a great boxer," said Takeshi Inoue. "We both had the skill to kill the other's boxing style. He was the better fighter tonight. I hope to get better and come back to the United States to fight again." "This is my second time coming to the USA to fight," said Xu Can. "Before I came here, I knew it was going to be a very hard fight. So I got ready for this fight. I did a lot of work for this. So, thank you to everyone. I respect my opponent, Rojas, my friend; he's very tough. But I knew I can win. I can! I can! I knew I can defeat this fighter. I knew I can defend his punch, even though his punch is very strong, but I had confidence in my defense. I just punched, defend, punched, defend, punched, defend." "I don't feel the decision was correct," said Jesus Rojas. "I don't know what to say. I'm surprised. I spoke to Golden Boy Promotions, and I want the rematch. I think we worked well. I used my jab and I want the fight. Of course, I want the rematch. 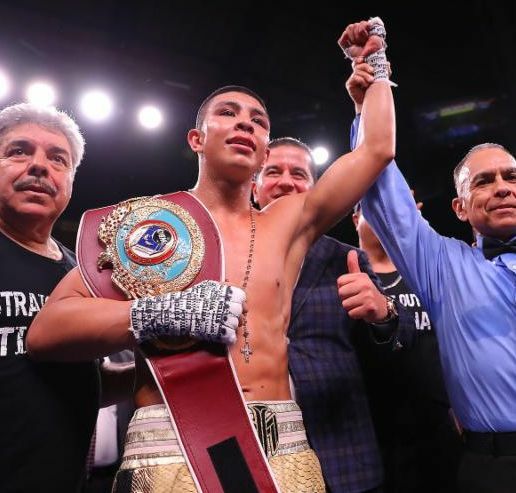 Vergil Ortiz (12-0, 12 KOs) of Dallas, Texas stopped Jesus Valdez (23-5-1, 12 KOs) of Huatabampo, Mexico via TKO in the fifth round due to a severe cut on Valdez's left eye in a super lightweight fight originally scheduled for ten rounds. "Fighting a southpaw for the first time as a pro is the same for me, but the range is different," said Vergil Ortiz. "I just had to make and execute a game plan. I thought it would go longer, but I'm grateful for the good will he had in the ring. I'm so happy to have fought in Texas!" Alex Rincon (6-0, 5 KOs) of Dallas, Texas defeated Jeremy Ramos (10-6, 4 KOs) of Bayamon, Puerto Rico via unanimous decision in a six-round super welterweight battle. Rincon won with scores of 60-54, 59-55, and 58-56. "I felt real good in there," said Alex Rincon. "I brought the fans from back home, and we have a lot of family here. Now everyone knows who the Rincon brothers are. Ramos was very awkward. When you catch him with hard shots, he comes back harder. We stuck to the game plan, and that's why we won." Alberto Melian (4-0, 3 KOs) of Buenos Aires, Argentina became the new NABA Super Bantamweight Champion by defeating Edgar Ortega (10-2-2, 5 KOs) of Mexicali, Mexico via TKO in the final round of a 10-round battle. The fight was stopped at 1:33 of the aforementioned round. "I was working the distance," said Alberto Melian. "I knew he [Ortega] was strong. When I found my distance, then I imposed myself more. That's how I got the knockout at the end. This is about patient work, so if the knockout comes, then it comes. We had great preparation at Churchill Boxing in Santa Monica." George Rincon (6-0, 3 KOs) of Dallas, Texas defeated Emmanuel Valadez (5-7, 4 KOs) of Agua Prieta, Mexico via TKO in the first round of a super lightweight bout originally scheduled for six rounds. Rincon won with time a of 1:36 of the aforementioned round. "I feel good," said George Rincon. "I went in there trying not to rush. There's never an opponent who is not dangerous because we are all out here fighting to provide for those we love and entertain those we don't. He [Valadez] didn't make it out of the first round, so I'm happy with that." Munguia vs. Inoue was a 12-round fight for the WBO Junior Middleweight World Title presented by Golden Boy Promotions in association with Zanfer Promotions and Teiken Promotions. Rojas vs. Can was a 12-round fight for the WBA Featherweight World Title presented by Golden Boy Promotions in association with Universal Promotions. The event was sponsored by Tecate, "THE OFFICIAL BEER OF BOXING," and Hennessy "Never Stop. Never Settle." The event took place Saturday, Jan. 26, 2019 at the Toyota Center in Houston, Texas and was streamed live on DAZN. For more information, visit www.goldenboypromotions.com and DAZN.com. Follow on Twitter @GoldenBoyBoxing, @Canelo, and @DAZN_USA. Become a fan on Facebook at www.facebook.com/GoldenBoyBoxing and https://www.facebook.com/DAZNUSA/. Follow on Instagram @GoldenBoyBoxing, @Canelo, and @DAZN_USA. Follow the conversation using #MunguiaInoue. and pasting the link http://bit.ly/January26DAZN into a browser. Credit must be provided to Golden Boy Promotions for any photo and/or video usage. Globally, DAZN is a live and on-demand sports streaming service created by fans, for fans, that is leading the charge to provide access to sports anytime, anywhere. DAZN guarantees no long-term contract, no bundles, just one affordable price for access to all the service's sports on connected devices including smart TVs, smartphones, tablets, games consoles and PCs. DAZN is currently available in Germany, Austria, Switzerland, Japan, Canada, Italy and now the U.S. at just $9.99 per month after a one-month free trial - where it is becoming a must-have service for sports fans, with a daily show featuring live look-ins to Major League Baseball games beginning in 2019 and more than 100 fight nights already lined up from Matchroom Boxing, Bellator MMA, the World Boxing Super Series, Combate Americas and the recently announced Golden Boy Promotions.